One of the central aspects of Jewish prayer service is the Torah reading. The Torah—a parchment scroll containing the Five Books of Moses handwritten in Hebrew—is removed from the ark and read at the bimah, a special table situated in the center of the synagogue. During the Torah reading service, the baal korei (“master reader”) reads from the text using a special tune known in Yiddish as trop. Learn to read any part of the Torah with trop with this amazing tool. During the course of the reading, a series of men (seven on Shabbat, six on Yom Kippur, five on holidays, four on Rosh Chodesh and Chol Hamoed, and three on weekdays and Shabbat afternoon) are called up to the bimah by their Hebrew names and the Hebrew names of their fathers. Once there, they say a short blessing, the reader reads a portion of the Torah, and they then recite a second blessing. This procedure is known as “getting an aliyah,” and it is considered a great honor. Learn to recite the aliyah blessings. The five books of the Torah are subdivided into 54 portions. Each portion, known as a Parshah or Sidra, is read on another week of the year so that the entire scroll is read through on an annual basis (two portions may be combined depending on that year’s calendar). You can learn insights into this week’s Parshah, here. There are also special selections to be read on holidays, often related to the theme of the day. For example, on Passover, we read the story of the Exodus from Egypt, which is celebrated on Passover. On Shavuot, we read of the Giving of the Torah, which is relived on Shavuot. In addition, on holidays (and Rosh Chodesh) we read the portions of the Torah that discuss the animals that were sacrificed on the altar on that day in the Holy Temple in Jerusalem. After each aliyah, a prayer called Mi Sheberach (“He who blessed”) is said for the person who was just honored. Traditionally, names of family members and others are mentioned as well, each one called out by their Hebrew names and the Hebrew names of their fathers. Depending on the custom of the synagogue, Mi Sheberachs may also be recited for others, most notably the Mi Sheberach for people in need of healing, each of whom is mentioned by their Hebrew names and the Hebrew names of their mothers. Read more: What Is a Mi Sheberach? 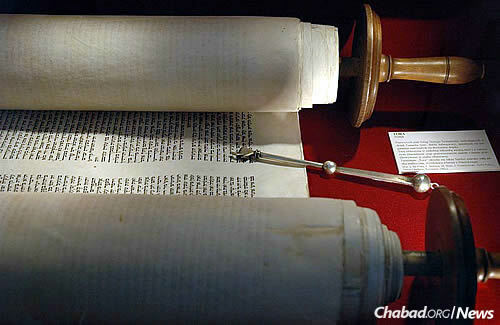 After the Torah is read (or before, in Sephardic tradition) the Torah is lifted high in the air and rotated to the right and the left, giving everyone the opportunity to view the sacred writing. At that time, it is customary to say some biblical verses, beginning with Vezot haTorah asher sam Moshe, “This is the Torah, which Moses presented.” Read more about Hagbah. Following the Torah reading, it is customary to chant a selection from the Prophets. Unlike the Torah reading, the Prophets are generally read out of a printed book with vowels and cantillation marks, making it much easier to read than the Parshah. This selection is known as haftarah, which means “conclusion,” since it is the final reading. Since the Prophets are not as sacred as the Five Books of Moses, the person honored with reading the haftarah also receives the final aliyah, known as maftir. The haftarah selection generally shares a theme with what was just read in the Torah or is linked to the time of year. The haftarah is read in a unique tune, different from the Torah reading. You can learn the tune (known in Yiddish as trop) of any haftarah using this amazing tool. According to tradition, it was Moses himself who instituted that three days never go by without the Torah being read. After all, Torah is compared to water. Just as water keeps a person alive and vibrant, constant engagement with the holy Torah keeps us pulsing with spiritual energy and connection. Read more about that, here. Why does the cohen get the first "aliyah"? In a sense, the honors that a kohen gets are a trade off for the fact that they do not have a portion in the Land of Israel. Due to their elevated status as those who serve in the Temple, they are honored with first aliyah.